Nile Istephan, chief executive of Eildon Housing Association. A social housing boss has hit out at Scottish Borders Council planners after seeing two sets of plans for affordable homes in Peebles and Galashiels rejected. 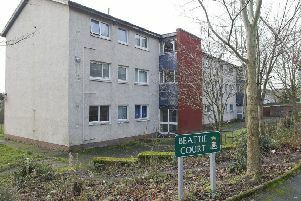 Eildon Housing Association had applications for new homes in Galashiels and Peebles thrown out at the same council meeting this week, sending it back to the drawing board. That double snub has prompted Nile Istephan, the Selkirk-based association’s chief executive, to call the decisions into question. Mr Istephan also said the association would now be considering lodging appeals against those rejections. “The rejection by councillors of two proposals for a total of 109 new homes is a significant setback to tackling the chronic lack of affordable housing in the Borders,” he said. “Councillors should be in no doubt that their decision denies scores of individuals and families high-quality, affordable homes in the town in which they wish to live and work. How the Coopersknowe Crescent houses in Galashiels would look. “We worked closely with council planning officials to ensure our applications complied in full with their requirements. “Both applications were recommended for approval. “All our work is in line with Scottish Borders Council’s strategic housing investment plan and Scottish Government targets on housing provision. “We will now consider whether to appeal against both decisions. The two applications rejected at Monday’s meeting of the council’s planning and building standards committee were for blocks of flats at Tweedbridge Court in Peebles and 11 extra homes to be added to 58 already approved at Coopersknowe Crescent in Galashiels.